Home / How Are Zippy Shell Storage Shells Different? How Are Zippy Shell Storage Shells Different? When you realize your favorite holiday decorations or that heirloom sleigh bed just won’t fit in your home, you have a lot of choices for storing those items elsewhere. Before you assume that all portable storage units offer the same benefits, think again. 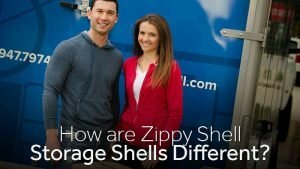 Zippy Shell has multiple benefits over other mobile storage shells that are equally valuable if you’re moving a long distance or just cleaning out the attic. Don’t lose your rental deposit over damage to the lawn because it was the only space available for parking your mobile storage unit. Zippy Shell storage shells are designed to meet local regulations regarding parking on the street, allowing you to stick to the street without getting a ticket or facing towing issues. Keeping the unit on the street makes it accessible and easy to take away when you’re finished. Other portable storage providers are earning some less than positive reviews based on the condition and quality of the units they’re providing. Customers have complained that other companies sent units that are dirty, moldy or damaged. Each moving unit provided by Zippy Shell looks brand new and is as clean as possible. You won’t have to worry about your favorite items getting dirty or moldy when they’re stored with our equipment. Some people feel uncomfortable about a lightweight and portable storage unit holding their items because they’re concerned it’s not as secure as a fixed building. There’s no need to worry about safety and security when storing your items in a Zippy Shell moving units. Each unit is built around a steel frame that won’t be damaged by falling debris or a bump from your neighbor’s car. The sides are reinforced with heavy duty metal wire to prevent access even if a desperate criminal tries to cut through the exterior cover. Whether you’re storing small items or the biggest and bulkiest pieces of furniture, our storage shells can support it all. You may not wonder about who owns every business you use throughout the course of a day, but you’ll want to know immediately if there’s a serious problem with the service you’re receiving. 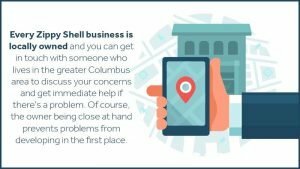 Every Zippy Shell business is locally owned and you can get in touch with someone who lives in the greater Columbus area to discuss your concerns and get immediate help if there’s a problem. Of course, the owner being close at hand prevents problems from developing in the first place. Finally, Zippy Shell still manages to keep prices 20 percent to 40 percent lower than the competition. Get in touch with us today at Zippy Shell Greater Columbus regardless of what you need to store or the length of the storage stay. We’ll put together a package that fits your needs, including your budget. What Makes Zippy Shell Portable Storage Unique?